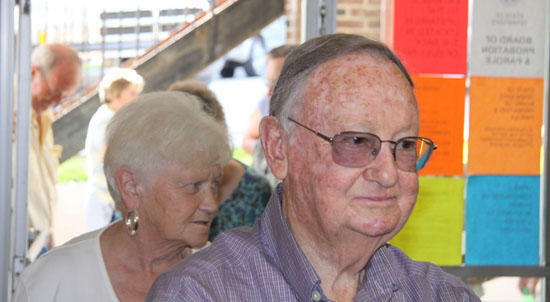 Cannon County Administrator of Elections Stan Dobson lets early voters through the door to the election office Friday. After a short delay caused by a computer glitch, voting in the 2010 General Election and State Primary began Friday morning at the Cannon County Election Office. A steady line of early voters filed into the hallway of the Adams Office Building on West Main Street starting at 9 a.m.
Once the machine problem was solved, the process for signing in and voting took from three to six minutes. Stan Dobson, Administrator of Elections for Cannon County, is encouraging voters to take advantage of early voting. Cannon County will be conducting early voting at the Election Office. The hours for early voting will be 9-12 each day with the exception of July 20th 2-6 pm and July 29th 2-6 pm. Early voting ends Saturday, July 31.